As most you already know, I'm getting married next year. Our wedding is a little less than 51 weeks away, but thus far we haven't done much. Yes, we have our venue, which is a huge relief, but the planning process has been on a stand still. There's so much to do and we get easily distracted - ADD, perhaps? Well, we need to get moving because 2012 will be here before you know it! In my attempt to get organized, I bought a binder ($12! - is it me, or is that a lot for a binder?) to gather all my inspirations. Also, I thought it’ll be fun to start an inspiration series. From now on, every Wednesday will be reserved for wedding ideas. Hope you guys like it. Darren and I (more so me) haven't decided a theme/colors yet. But, originally I had my heart set on a white wedding. Everything about it is just perfect; simple, understated, elegant and glamorous. What's there not to love? Of course, this was way before the famous wedding of Kate Middleton & Prince William (and Kim K. too, I guess). I predict white will be huge for 2012 and I rather not be a part of that trend. But, gosh darn it; why do I have to love everything about it?! 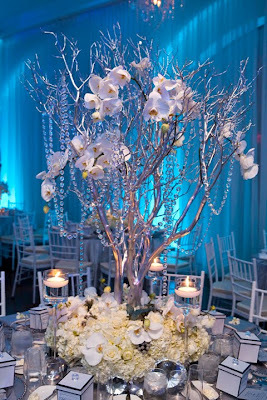 i love the white wedding theme too, it's just so... clean and expensive looking. don't let the fact that its been done deter you, i'm sure yours will be original either way! beautiful. love your style, as always, khatu. you should start a Pinterest. look into it. you can collect your ideas virtually. i spent $20 on a wedding book i barely looked at! (do you want it?!) i know your pain! you are better off looking at all the wedding blogs (once wed, ruffled, etc) and saving everything to your email! its so beautiful! i think it looks very good in pictures too. How exciting!! Can't wait to see/hear all about your plans and the wedding planning process. Have you looked at pininterest.com? I use that site to gather all my insirational ideas and pics. :) you can find lots of wedding ideas there. I hate when it's been done by highly photographed, highly popular couples so that it becomes hijacked by a bunch of others who will try to emulate the trend and sully what you originally had in mind. That being said, don't let that deter you... Maybe try adding in another accent color? White and.... something vibrant. I can't imagine you in white shoes, anyway. Go for something brilliant and use that as your accent color and use it very sparingly. 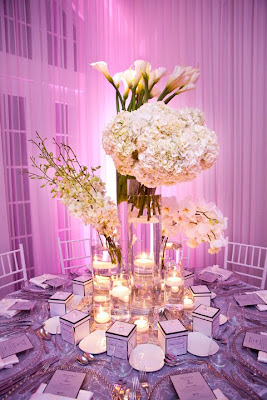 A small flower here in a big center piece, a ribbon there and white everything else. That way your white wedding will stand out more and no one could ever accuse you of imitating anyone. How grand of a scale do you plan on? If you really like an all white wedding I don't think it being "trendy" should deter you. From years to come you'll forget about all the celeb weddings anyway. Do you read Joanna Goddard's blog? She used to blog about weddings often (low key ceremonies especially). She once mentioned a wedding where all the bridesmaids wore white but the bride wore pink, lol. I love the idea of a white wedding! So elegant and beautiful. Definitely do the white wedding. It would be so pure and elegant. 1 year will go by so quickly so enjoy these moments of planning your wedding. A white wedding is classic though, I don't think it can really be considered a "trend"... you should still do it! Looking forward to your new Wednesday features, I love wedding inspo! I second Aubs' Pinterest suggestion. Who knows, maybe it'll keep you so organized you can return the binder :) If you need an invite, let us know! Hey there, Khatu, I'm a fellow petite from Boston. Just recently discovered your blog and am loving it! Do you have any pictures from last week's FNO? Please do share! Wow white weddings never looked so good. I don't like color so I am sticking to white, black, and silver...:-) can't wait to see more of your inspirations! yes I think after Kate and Will the white wedding will be huge! But who cares, you can always put your own spin on it! Are you on pinterest? (Sorry can't remember!) That would be a great site to gather all your ideas! doesn't matter if everyone is doing white, do it cuz YOU want it. have fun with it, girl! If you haven't joined already, Pinterest is a great way to find wedding inspirations. My friend is getting married next year and we both pin ideas to a board. i say do what YOU want, whether it's on trend or not. Beautiful wedding photos. You can find more at Pinterest. Have a great weekend! Awesome Pics !!! Everything is decorate perfectly. 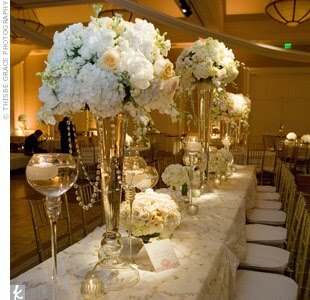 Angels with bride pic and tables decoration in hall (2nd one) are superb. You don't have to be uber traditional and have an all white wedding everywhere. 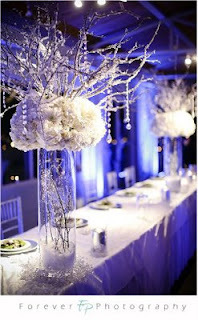 For example, you can have your ceremony with colorful flowers and then have the reception in all white, which looks very dramatic at night with proper lighting. And I know you are pretty and don't need to worry about standing out but please don't let your bridesmaids wear white. You should be the only stand out on your special day. That was Kim K's biggest blunder. No matter what I'm sure it will be amazing!